With Google FriendConnect you can add social network features to your site and visitors can then sign in with their Google, AIM or OpenID account to join you. Hence more people engaging more deeply with your website with each other by choosing engaging social features from a catalog of gadgets by Google and the OpenSocial developer community (Engage.com, Friendster, hi5, Hyves, imeem, LinkedIn, MySpace, Ning, Oracle, orkut, Plaxo, Salesforce.com, Six Apart, Tianji, Viadeo, and XING). 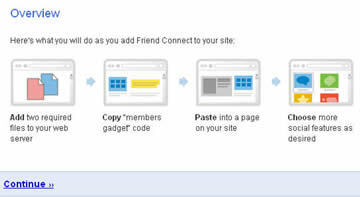 Download Google FriendConnect for Joomla module here . On "Overview" page, click on "Continue>>"
Fill in your website's name and URL and click on "Continue"
Once you reach this step, you will need to download "rpc_delay.html" and "canvas.html" manually and ensure to upload this two HTML pages to your website's root folder before you proceed to next step by clicking on "Continue>>" link. 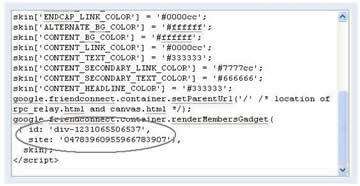 Once you have uploaded those two HTML files, click on "Continue>>" link. 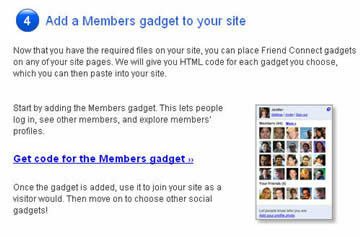 You are landing on "Add a Members gadget to your site" page now. On "Set up the Members gadget" page, you can skip Step 1 and 2 because you are going to do this setting on your Joomla administrator page when you are setting up Google FriendConnect module at later stage. As for now, scroll down until you find Step 3 and you can click on "Generate Code" button. 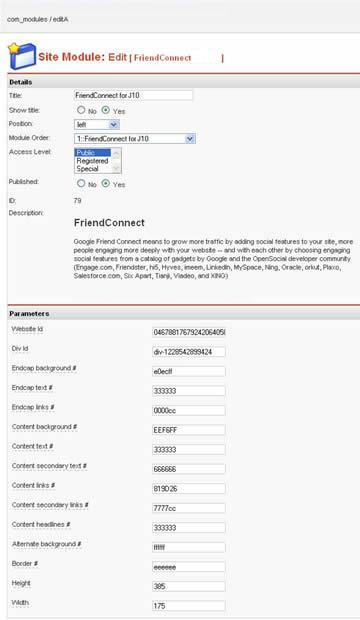 Copy your website id and div id (as circled below), you will need this two ids when you are going to setup Google FriendConnect module. You can login now to your Joomla administrator page, install Google FriendConnect module, go to Modules -> Site Modules -> select Google FriendConnect module and the rest is quite self-explanatory. Worked out of the box on Joomla 1.9 with SEF turned off. Absolutely genius way to give your users an easy way to spread the word about your site on all their Social sites. This is a great alternate, be it more of a upgrade to the core joomla Google plugin which has never worked for us on Linux. Our client's primary site Vern Gosdin - The Voice of Country Music will greatly benefit from this wonderfull Google Friends connect joomla extension.